Elements ---- Two hands 臼 + person 人. Phonetic series 臾.
Pictogram of two hands 臼 at either side of a person 人 (clearly seen in the OBC pictogram), suggesting he is catching something or working in the field. Loan to ‘moment’ perhaps for the short time needed to catch something. Most of the scholars consider that the original pictogram showed two hands catching a man from his neck. 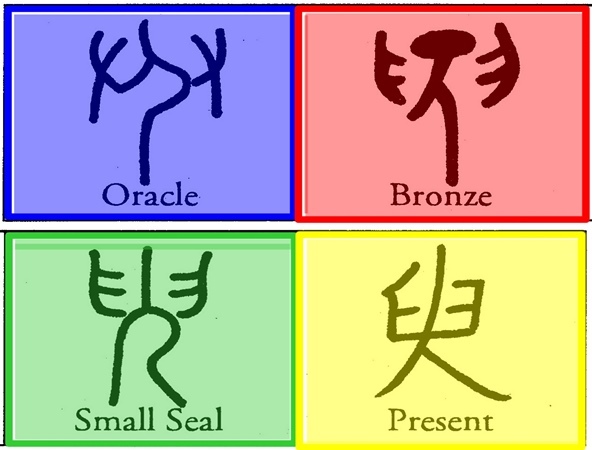 The Oracle Bone pictogram shows two hands, but in no way the hands are on other person's neck. Cheng Menghun in his Dictionary of Old Chinese gives "fertil field" as its original meaning. In view of the meaning of the characters of this family, all they related with the agricultural activities, I suggest that the two hands are the hands of the person working in the field. The new meaning "moment, instant" could refer to the time needed to catch some plants.